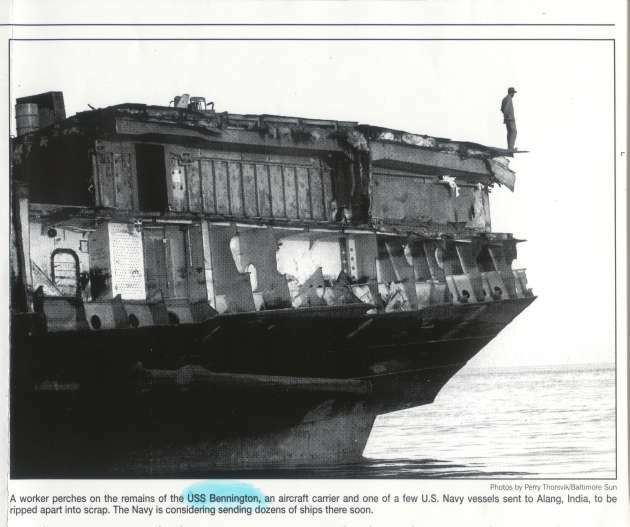 This picture was taken as her island was being dismantled and bulldozed directly into the hangar bay thru a hole blown into the flight deck by dynamite, . 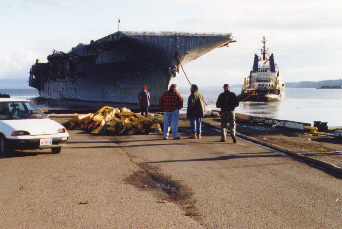 In late November, 1994, final preparations were being made for Bennington's Final Voyage across the Pacific. 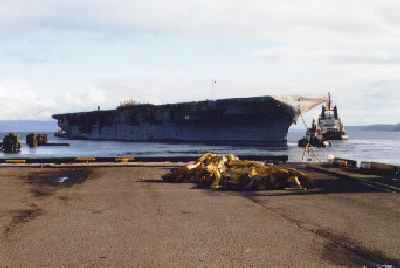 December 7, 1994, with the island completely gone, and the hole in the flight deck sealed up, all was ready for the 3 month voyage across the Pacific, to Alang, India. The ship was getting underway and being towed by the 5th largest ocean going tug in the world, the Smit Singapore, whitch had a 27,000HP engine. She is now ready for a 2 month Pacific crossing to India, which had been delayed, and was left standing by for 3 weeks, (at a rate of $27,000 a day) while final paperwork was being processed. I was under the impression the "Benny" was dismantled in India. You didn't go there and take pictures, I don't imagine, so my info is obviously wrong. I was not there when Bennington arrived in Alang, India, but a Television crew from Port Angeles, Washington was, and they did a series "Passage to India" about the arrival of Bennington, and interviewed the new Indian owners and gave a tour of the steel mill where she was being cut up for construction material. 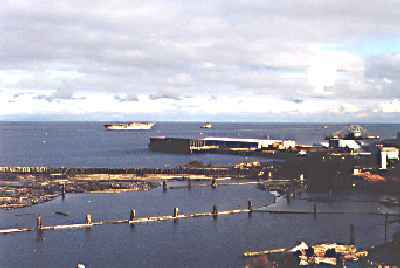 The trip was originally planned for 2 1/2 months, but 2 days out, a commercial containership, the Hyundai Seattle, suffered an engine room fire off the coast of Alaska, the ship was abandoned, and the crew rescued by the Coast Guard. The owners of the tug, seeing a "quick chance to pick up some money" cut Bennington adrift, and went full speed ahead to the containership, took it under tow, brought it back to Seattle and filed the papers for salvage rights. 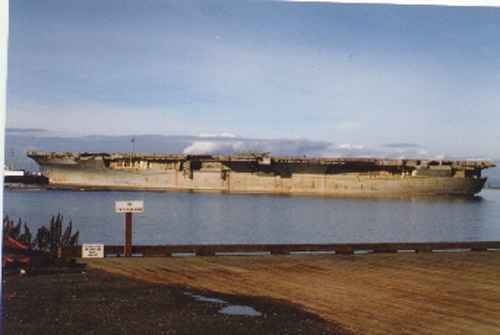 Then proceeded back to Benn, which had been temporarily stabilized by 2 tugs of the Crowley fleet, out of San Francisco. 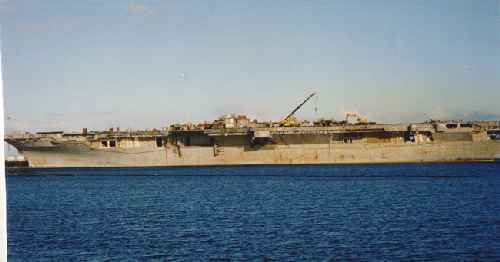 Smit Singapore, then completed the voyage across the Pacific, arriving in India in early March, 1995. "Passage To India.....Final Voyage of the USS Bennington"
and the commentary from Tom Hawksworth, "The last Master At Arms"